How outrageous, how heartbreaking, how truly grotesque! 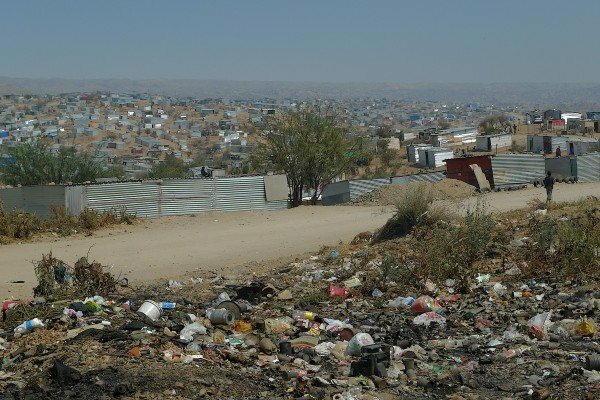 Windhoek City – the capital of Namibia – is, at one extreme full of flowers and Mediterranean-style villas, and at the other, it is nothing more than a tremendous slum without water or electricity. And in between, there is the town center– with its Germanic orderly feel, boasting ‘colonial architecture’, including Protestant churches and commemorative plaques mourning those brave German men, women and children, those martyrs, who died during the uprisings and wars conducted by local indigenous people. The most divisive and absurd of those memorials is the so-called “Equestrian Monument”, more commonly known as “The Horse” or under its German original names, Reiterdenkmal and Südwester Reiter (Rider of South-West). It is a statue inaugurated on 27 January 1912, which was the birthday of the German emperor Wilhelm II. 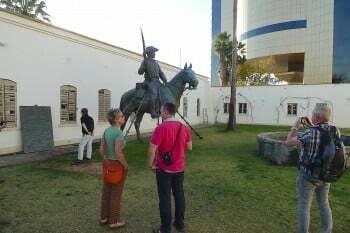 The monument “honors the soldiers and civilians that died on the German side of the Herero and Namaqua ‘War’ of 1904–1907’”. That ‘war’ was not really a war; it was nothing more than genocide, a holocaust. And Namibia was a prelude to what German Nazis later tried to implement on European soil. “The Horse” was recently removed from its original location, and placed in the courtyard of the old wing of The National Museum, together with some of the most outrageous commemorative plaques, glorifying German actions in this part of the world. Nothing was destroyed, instead just taken away from prime locations. Where “The Horse” stood, there now stands a proud anti-colonialist statue, that of a man and a woman with broken shackles, which declares, “Their Blood Waters Our Freedom”. Germany never officially apologized for its crimes against humanity in what it used to call German South-West Africa. It did not pay reparations. 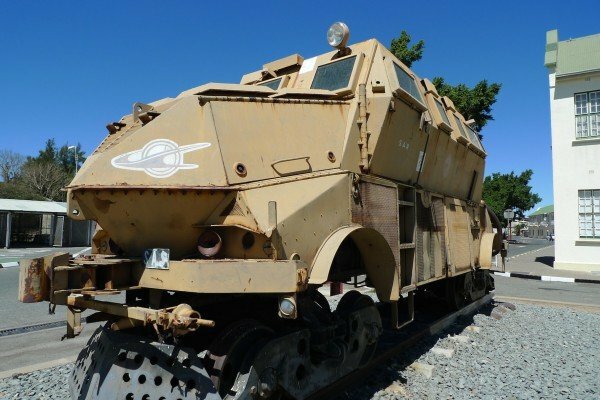 A visit to those German genocidal relics is ‘an absolute must’ for countless Central European tourists that descend every day on Namibia. I followed several of these groups, listening to their conversations. Among these people, there appears to be no remorse, and almost no soul-searching: just snapshots, posing in front of the monuments and racist insignias, pub-style/beer jokes at places where entire cultures and nations were exterminated! Central European, German-speaking tourists in Windhoek, appear to be lobotomized, and totally emotionless. And so are many of the descendants of those German ‘genocidal pioneers’. Encountering them is like déjà vu; it brings back memories of the years when I was fighting against the German Nazi colony, ‘Colonia Dignidad’ in Chile; or when I was investigating the atrocities and links, of the German Nazi community in Paraguay to several South American fascist regimes that had been implanted and maintained by the West. And now the German community in Namibia is protesting the removal of “The Horse”. It is indignant. And this community is still powerful, even omnipotent, here in Namibia. 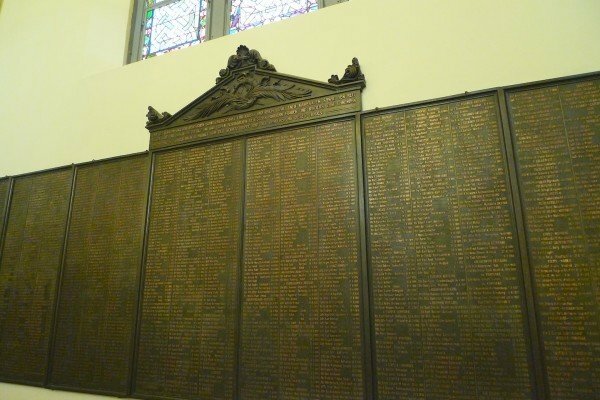 Almost nobody calls the ‘events’ that took place here, by their rightful names, of holocaust or genocide. Everything in Namibia is ‘sensitive’. Every year the Herero hold solemn ceremonies to remember the first genocide of history’s bloodiest century, when German troops drove them into the desert to die, annihilating 80 per cent of their population through starvation, thirst, and slave labor in concentration camps. The Nama, a smaller ethnic group, lost half of their population from the same persecution. The Namibian government is still negotiating the return (from Germany) of all skulls of the local people, which were used in German laboratories and by German scientists to prove the superiority of the white race. German colonialists decapitated Herero and Nama people, and at least 300 heads were transported to German laboratories for ‘scientific research’. Many were ‘discovered’ in the Medical History Museum of the Charite hospital in Berlin, and at Freiburg University. Leading German doctor, who was working on ‘the pure race doctrine’ in Namibia (the doctrine later used by the Nazis), was doctor Fisher. He ‘educated’ many German physicians, including Doctor Mengele. It is all to a very little surprise, considering that the first German governor of the colony was the father of Hitler’s deputy Herman Goering. Germany’s holocaust in ‘South-West Africa’ is, among other things, a proof that the common Western theory about how German Nazism came to existence before the WWII was totally wrong. According to that theory, after the WWI, defeated and humiliated Germany got radicalized and ‘reacted’ monstrously to its condition. But in reality, before and during the Second World War, Germany simply decided to behave in Europe exactly as it was behaving in its colonies, for many decades. 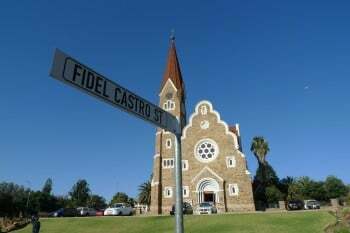 There are Robert Mugabe and Fidel Castro Streets in the center of Windhoek. 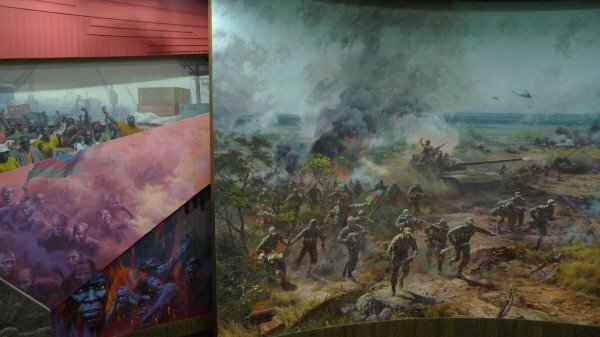 And there is that tremendous National Museum, commemorating the national-liberation struggle and the role of the heroic Cuban and North Korean troops in their fight against Western-supported apartheid. Bizarrely, German pre-Nazi/WWII monuments and insignias literally rub their shoulders alongside those great liberation struggle tributes. Divisions are shocking: ideological, racial, social. In Namibia, there is segregation on an enormous scale, everywhere. 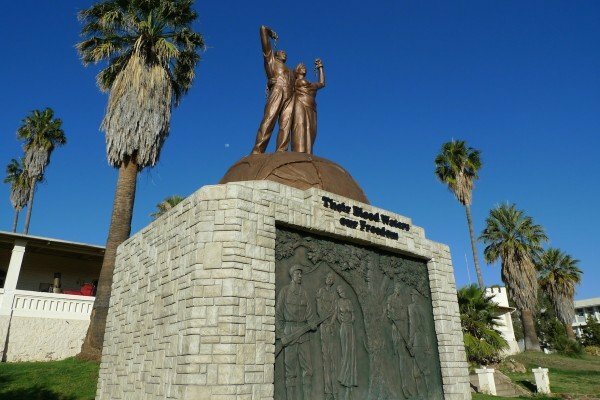 While neighboring South Africa is moving rapidly away from racial segregation, introducing countless social policies, including free medical care, education and social housing, Namibia remains one of the most segregated countries on earth, with great private services for the rich, and almost nothing for the poor majority. Katutura is where the black people were moved to, during apartheid. My friend, a ‘colored’ Namibian, who fought for the independence of his own country and of Angola, drove me to that outrageous slum which seems to host a substantial amount of the capital’s population, with mostly no access to basic sanitation or electricity. “Sprechen Sie Deutch?” A black Namibian man intercepts me, as I am walking down the Fidel Castro Street. “I do, but I would rather not, here”, I explain. 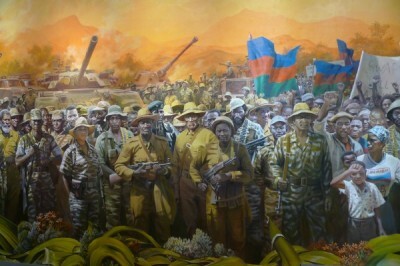 At the new and lavish National Museum in Windhoek, I salute the Namibian and foreign fighters against apartheid – those who struggled and died for freedom, and the independence of Africa. 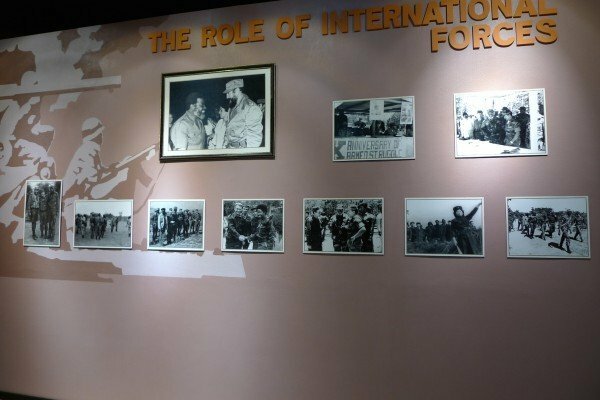 Then, I descended to the “Goethe Institute”, the German cultural center, a colonial building surrounded by barbed wire. There, a local starlet is loudly rehearsing for something called ‘a night under the stars’, or something of that sentimental, over-sugary pop nature. These are basically evenings designed to bring together the pampered international crowd and those ‘feel-good-about-life’ local elites. I ask the starlet, whether this institute is trying to address the most painful issues of the past and present, all connected to Germany, of course. One evening I eat at Angolan/Portuguese restaurant in Windhoek, O Portuga; an institution known for its great food and mixed crowd. What an evening, what a place! After dinner, I dive into German ‘Andy’s Bar’, a nearby place that was described to me as “An institution, which not even a black or a colored person from the embassies or the UN would dare to enter”. The Beer is flat, but the conversation of the local crowd is extremely ‘sharp’. Patrons are freely giving black Namibians names of local farm animals. Their spite is open and sincere. I listen, I understand. Eventually I leave. I catch a taxi, driven by a corpulent black man. The radio is blasting and I hear the socialist, anti-imperialist lyrics of ‘Ndilimani’, a brilliant local political band. It is now well past midnight, and despite the warnings from all those ‘well-meaning Germans’ that I met in Windhoek, I feel much safer in this taxi than in Andy’s Bar and in so many other similar institutions. “Is this country really governed by Marxist SWAPO?” I wonder aloud. I tell him that I am beginning to understand what drove Robert Mugabe mad and angry, in Zimbabwe. The driver nods. I push my seat back, and make it recline. “It is all f***ed up”, I say.